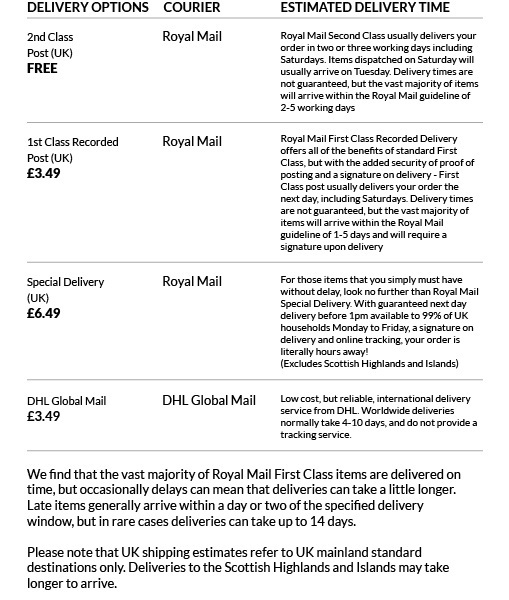 We do not deliver currently to all countries in the world and we do not offer a tracked delivery service. We are looking to improve our coverage of areas which we can ship to, but this site is intended for the use of UK customers. We are not in control of the postal system and can only send items using a third party courier (Royal Mail or DHL) in good faith. As such we can't guarantee our items are delivered within a specific time frame. It is the customer’s responsibility to enter a correct address in full on their order, if an item does not arrive due to an incomplete address on the part of the customer, we can’t issue a replacement. If your delivery address is outside of the United Kingdom you may be subject to import duties and taxes, which are levied once a shipment reaches your country. Any such additional charges for customs clearance must be borne by you. 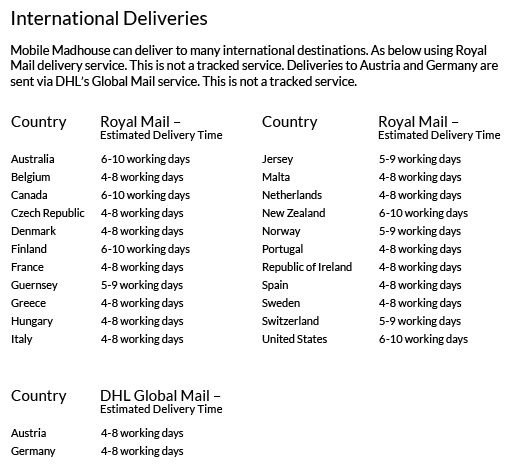 You should note that customs policies vary widely from country to country; Mobile Madhouse advises each customer to contact their local customs office for further information. From time to time Mobile Madhouse may engage a 3rd party to fulfill orders, a contract for the sale of these products will be made between the 3rd party supplier and yourself.